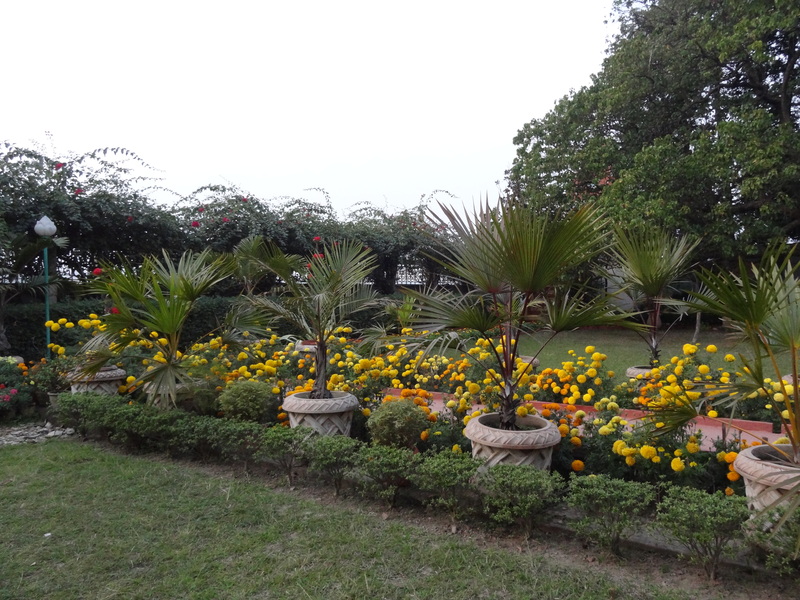 As a gardener, I had longed all week to ask permission to water the flowers here at the Dakshineswar ashram. They seemed to yearn for it. The dust covered trees look tired and thirsty. Their leaves have no turgor, but water is a luxury in India. I am a guest here and don’t know what might be appropriate. All afternoon the clouds dance a slow motion choreography—forming and reforming, billowing into mounds that tease a promise of moisture and relief from the heat. I walk to the small temple off the portico for the 4 PM meditation. The first time I walked into this temple my body shivered, and I knew I had been here before–the blue carpet and little chairs that fit me perfectly. I love the sincerity of the brahmacharis (monks in training) who conduct our meditations and the very humorous way they pronounce the English language. There is more ceremony and ritual here in India. Meditating in this little temple makes me feel divinely happy. Soon, however, the weather pulls my concentration out the windows. Thunder rumbles in the distance. Perhaps it is just more fireworks. There are so many celebrations in India. The breeze coming through the window has more moisture in it, and the thunder is quickly becoming serious. As twilight settles over the Ganges, I can see flashes of lightning through closed eyes. The whole room fills with light. The next thunderbolt startles me, and I jump two inches out of my seat. I give up. I can’t contain myself any longer. The smell of coming rain and damp dust on the trees lures me outside, and I gather my things and quietly step out of the meditation room. I race below the portico into the garden where no one can see me behave improperly. Indian women always act in a refined, gracious manner, but I feel insuppressible and can’t stop from twirling and dancing –swept up in the currents of cool refreshing wind. It’s not my imagination. I can feel the anticipation of the trees and plants. 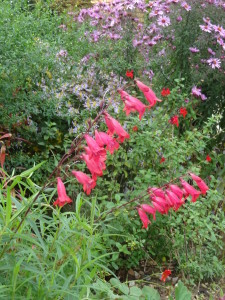 Their leaves shimmy and dance in the wind like playful children. 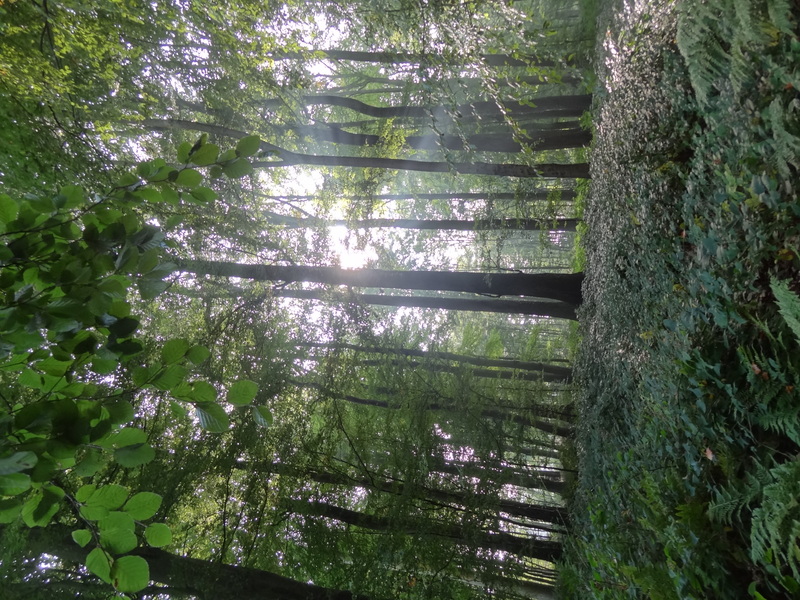 An electric presence in the air bathes me in, what to call it, “Joy!” Before meditation at the Yogoda Satsanga Society we often sing a chant called “Joy, Joy, Joy.” I’ve sung it for many years, but until this moment “joy” had been just a word to me. My body feels like it’s ready to burst with this great empathy for the earth and plants. I remembered my five year old daughter. On Christmas morning many years ago, she climbed into bed with us at 4 AM. “There’s a bicycle under the Christmas tree,” she exclaimed with so much exuberance I thought her little body would literally explode. Could this feeling be contained within the walls of my skin? It is quickly getting dark. Thunder cracks overhead just above the tree tops. Then, like an overfilled water balloon, the clouds burst and pelt the earth. Winds are swirling around me in gale force ferocity. I am getting soaked. Before leaving Rishikesh we did catch an afternoon aarti on the Ganges. Aarati is devotional singing on the steps (ghats) that lead to the river. The Austrian Ambassador was visiting with a Chamber Orchestra that day. 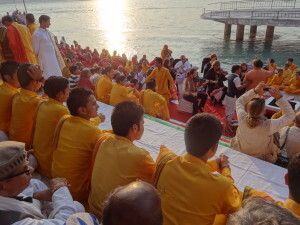 It was a symbolic celebration– kick off to a program blending the waters of the Danube and the Ganges to purify the Ganges, and a blending of the music of East and West. The director of the Vienna Boys Choir was there. He led some of the young students in chanting. The boys in the picture in yellow all came from poor families and the Parmath niketan ashram is providing their education and a place to grow up. In typical Indian style, there was much officious and long winded ceremonies. Our Lichtenstein friend went with us. We were squeezed together on the steps. She and I admired the sarees of the Hindu ladies behind us (it was also some kind of a ladies day celebration), and then we were all buddies. Language is only one way to communicate– pointing, laughing, pantomime and a lot of thank yous says a heck of a lot. I think they saw me telling Dave what to do,(NO, not me) so they tapped me on the shoulder and pointed to the men standing in front of us, blocking our view. Once I stood up and asked the men to sit down, those women were patting my head and hugging me. They wouldnt have dared do that themselves. 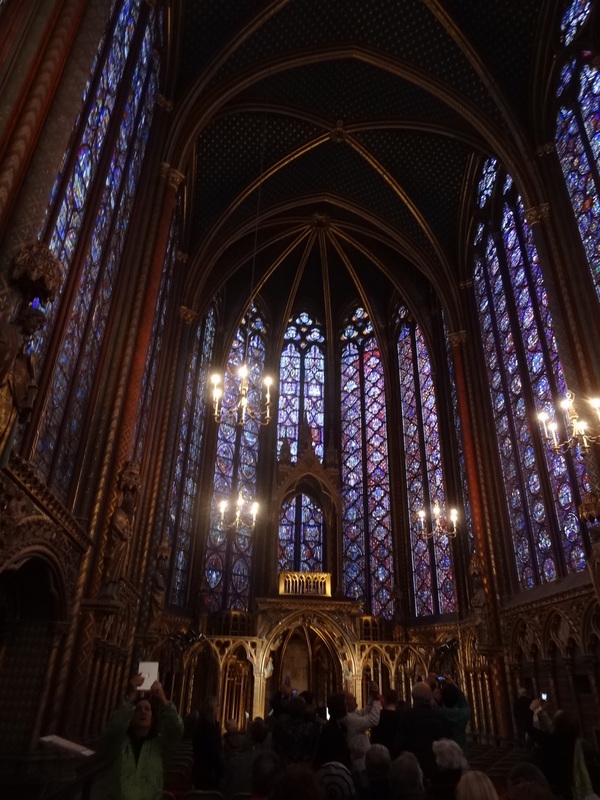 It was truly beautiful, but more opulent than anything I’ve ever seen before. I especially liked the smoking room for men—red and gold paneling, velour couches and chairs surrounding a fireplace. As we were leaving, the footman/bellboy asked if we would like to ride out to the gate in the Maharini’s car. 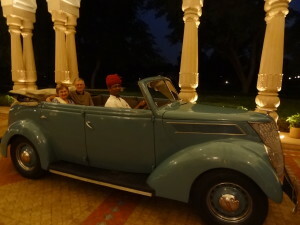 It was, as you can see in the photo, a 1937 Ford convertible. She wasn’t just a glamorous, wealthy woman. She ran for public office, started several girl’s schools, and cataloged much of the treasures to be preserved for the public in her other palace. The Maharajah willingly gave up his kingdom in order to achieve unity for India after independence. We spent the last days of our visit here at the Diggi Palace Hotel. 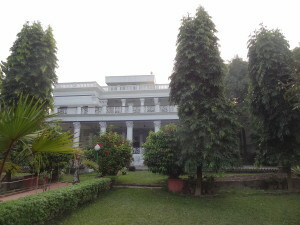 Smaller palace with lovely garden for breakfasts and lunches. Lots of families and people from all over the world traveling. this 300 year old building is a little run down but has more trees and birds and nature than any other place we’ve been to. Around the ceilings and walls are delicately painted borders. I thought they had to be stencils as they are so precise, but was able to watch one of the painters who was called in to spiff up some of his work. There is an internationally known writers’ conference here once a year. Also visited the Amber Fort which was the setting for the film, Jodha Akbar. A small textile museum near there is working to maintain the local embroidery, block printing and tie dyeing that families have done in Rajasthan for centuries. Knowing I’m going to spend the night on a train fills me with anticipation. There is a certain intimacy of sharing a cabin with other passengers, and in India, usually great conversations. There are always beggars at the train station that, like a heart surgeon, crack open your chest and re-adjust the heart strings. The station is filled with colorful blankets and families sleeping on the floor everywhere. The train arrives and a mad rush to climb on board begins. Indian people are patient and polite except in crowds when they push their advantage as much as possible. 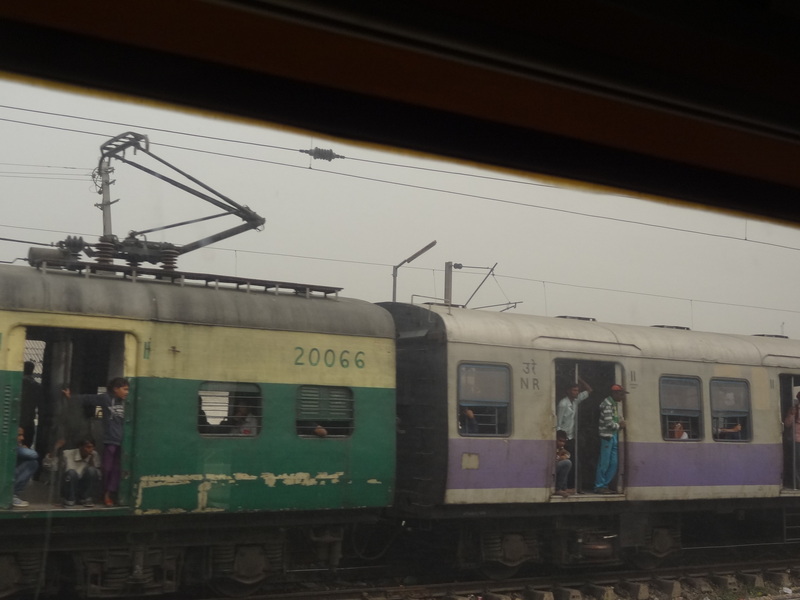 Once we are settled and in our compartment the train finally burps and lurches forward. Moving, slowly out of the station—then the clackety clackety clackety of building up speed. It begins like a horse in a gentle walk, then the riotous movement of a trot and finally, at full speed, it settles into a good gallop. I sink into my dark cubby hole of a top bunk allowing “train yoga” to do its work as it jostles my body like jello. I am almost dropping off to sleep when the rumbling is interrupted by another train passing in the dark night. 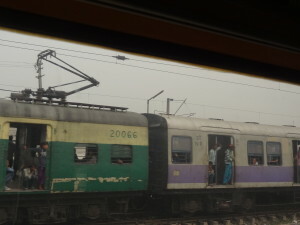 Its horn blasts an eery sound, a certain loneliness that only trains in India have– even more mournful as it fades in the distance. There’s something mysterious about hordes of humanity rushing to where I have just come from. I wonder, are they journeys of hope, of survival, a pilgrimage? Most people in India are not traveling for pleasure. This is a first class air conditioned compartment, A certain guilt comes over me as I know the difficulty of sitting in the third class section, families squeezed onto benches with so many others, trying to sleep a little through the night, but David and I are too old to ever do that again. The air conditioner in our compartment is what we call in the states a noisy ceiling fan. It spews out burnt smelling air, but still it cools a bit and provides additional background music to sleep by. The porter brings a packet of clean sheets, and I pull a wool shawl over my head. It’s sheepy barnyard smell is comforting. I turn, toss. Havent seen any lions in India as yet, but can hear their roar/snores in a cabin nearby.. Wide awake! Listening to the creakings and squeakings of a train that is probably older than the one my grandfather rode as a caboose man. Mind travels to those long ago memories—my grandmother and I sat in her 57 Chevy in the Rock Island train yard in Illinois, waiting. Finally my grandfather appears, his bald head shining in the late afternoon light. He limps over the tracks toward us, his old war injury always a source for another story or one I’ve heard many times before. I run across the tracks to meet him and wave goodbye to his old cronies who always remember my name. The memories drop me into that snoozing dreamlike state and finally to sleep. In the morning Delhi. In the dawn light I can see rice paddies like patchwork squares and sugarcane fields far into the distance. Along the tracks are neatly laid out cow patties placed in the sun to dry, later to become fire for the home next to piles of burning trash. Occasionally the smell of sewage comes thru the air. Red plumed pampas grass lines the tracks and women in fluorescent colored sarees walk with water bottles in their hands or on their heads.Train crossings oxcarts and Tata trucks line up. Bicycle rickshaws taking children in fresh uniforms to school, and hundreds of young men on motorcycles all waiting for the train to pass. Another day in India. In India I found a race of mortals living on the earth, but not adhering to it. Inhabiting cities but not being fixed to them. Possessing everything but possessed by nothing. Yesterday in meditation I could hear the Brahmachari laughing upstairs in the hallway so I walked up there. 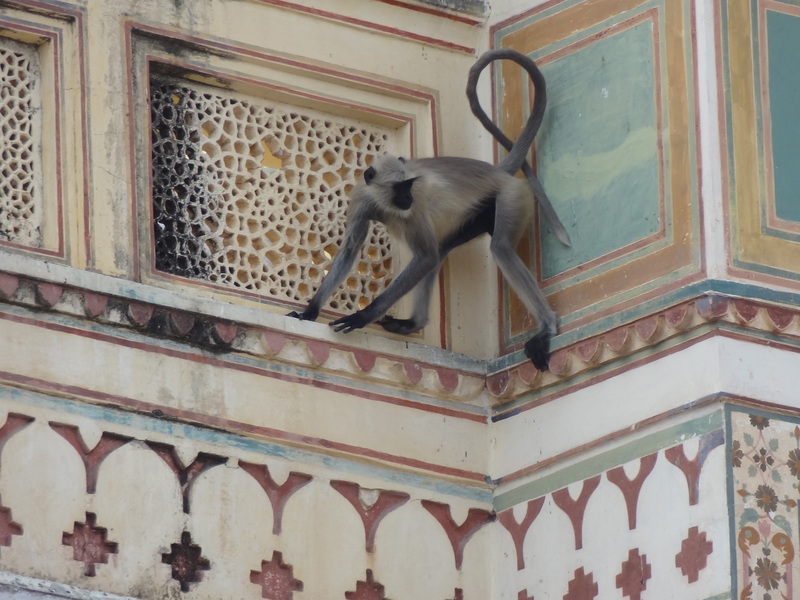 I’ve seen him over the years in Dakshinesar ashram. He has a deep baritone voice, but when he sings it is so sincere and pure. He was talking with a couple of families who were visiting — delightful to see their older children bowing and idolizing this man of God instead of some football hero or a rock star. He isn’t, however, a “book learned” religious man. He exudes something which the word love doesn’t quite describe. Standing near him, it felt sort of like that moment when they lay your first child in your arms and new circuits light up your “mother channel” deep within your being. (or hopefully the cleaning woman is currently enjoying it). We walked further and met another new friend, Rajif, my adopted son. He arranged that David and I meet with two local people who own a travel agency. In the past in India we often flew by the seat of our pants– planning a few days a head and deciding where we wanted to go. Not now. It has become so much more Westernized that booking ahead is a necessity. We met our angels, Anurag and Shaifalli, in the library of the ashram. They are partners in a company called Travel Mate here in Delhi. Both are devotees and had lived the corporate life and were miserable. Six years ago they became partners and formed a travel company. In two hours of chatting, they planned the best prices and connections on plane and train tickets for our whole five weeks– all on Shaifalli’s computer– her fingers tap danced on the computer keys. Can you imagine anyone in the U.S. sitting down with you for a free three hour business consultation? (Well, except for you, MaryHelen) At the end of our scheduling session, David mentioned that I loved to eat and wrote a little bit about food. They twittered away in Hindi and then he asked if we join them to sample one of Anurag’s favorite delis in Delhi. The place looked ordinary like most bakery/delis UNTIL. . . The first dish to arrive was called Pani Poori The plate held four bowls of sauce and a tray of what looked like small bird’s eggs with a center filled with a bit of vegetable and potato. You spooned ea sauce into the opening and popped it in your mouth. textures flavors alive in your mouth at once. They did a little dance on your tongue. Next dish was called Aalu Tikki it was a bowl of yogurt or here it is called paneer. Floating in it deep fried crispy potatos chunks. Slightly sweet strips of red veg over top. A green and golden sauce swirled through Mysterious mix – not really sweet, almost hot, definitely tangy, and great textures. The smell was so enticing. David and I see so many good changes in India. More abundant water, more hot water Yea! A garbage system that’s making a dent (in some cities). Fly overs (aka overpasses) So many young people in the local mall carrying many shopping bags. But Anurag says that only 10% of the people lives are improving. The villages haven’t changed much. Just couldn’t find our place for a the first few days here. We’ve been so spoiled being around such loving thoughtful people in the ashrams and finally we are on our own. And I was ready for a real bathtub and pretty sheets—just not 30 any more. 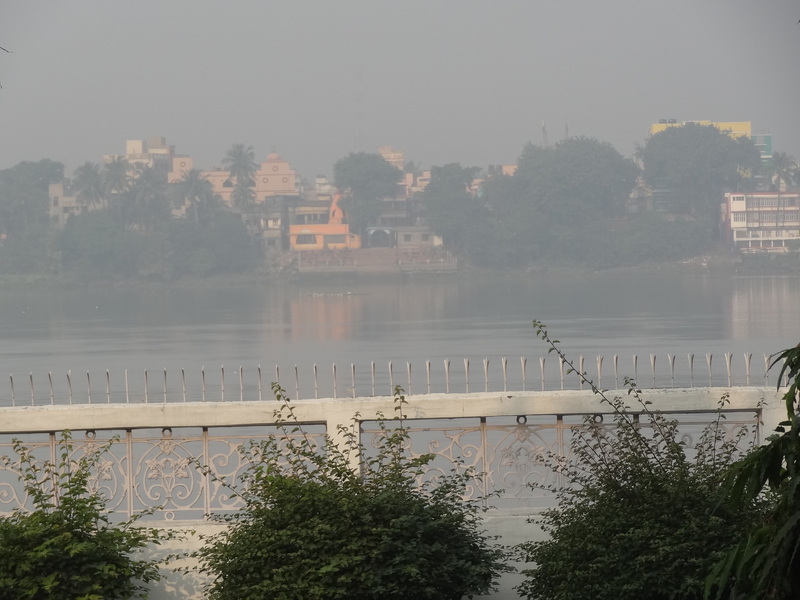 Now we are in a clean, sweet place with a great rooftop where we can see the Ganges. there is such a smorgasboard of yoga and spirituality here. All david and I want to do is sit on our roof and watch the world go by. I woke this morning at 5:30 AM with sound of a pony clip clopping on the cobblestone street below bringing rocks down to the main road. Sun breaks over the mountain and the Ganges almost glitters in the morning light. By 6:30 trucks and tuk tuks (motorcycle taxis) are revving their engines and the monkeys are squabbling. Yesterday David and I took a taxi to Vashistha guhu (guhu means cave). Mr. Toad’s Ride is nothin’ compared to these taxi drivers on mountain roads (but don’t worry about us). The cave went back into the cliff side, and we sat in there for an hour and walked along the Ganges before all the tour buses arrived. I don’t remember the saint’s name, but he lived there until his mahasamadhi. In India they celebrate not only birthdays but the day they leave the earth, called mahasamadhi. 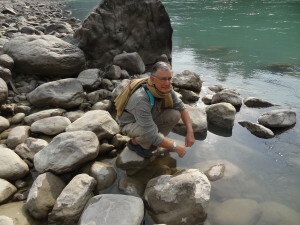 If we had more time, I’d go back there and stay in a guest house far from the commotion of Rishikesh. Have another new friend in this guest house. Can’t remember her name so we call her Lichtenstein which is where she is from. 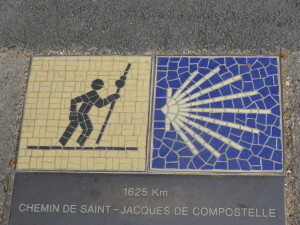 Anyone know where that is? Monet’s Kitchen –blues and yellows and lots of copper. We’re moving in! Actually, it started a year ago. I helped a friend, judy, with her garage sale when she was selling her house. She gave me a book called Gardens of France. 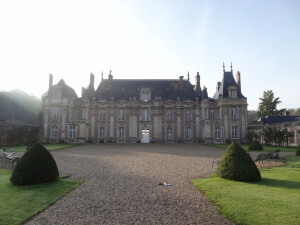 I wrote down ones I’d like to visit and Miromesnil Chateau was close to our route. 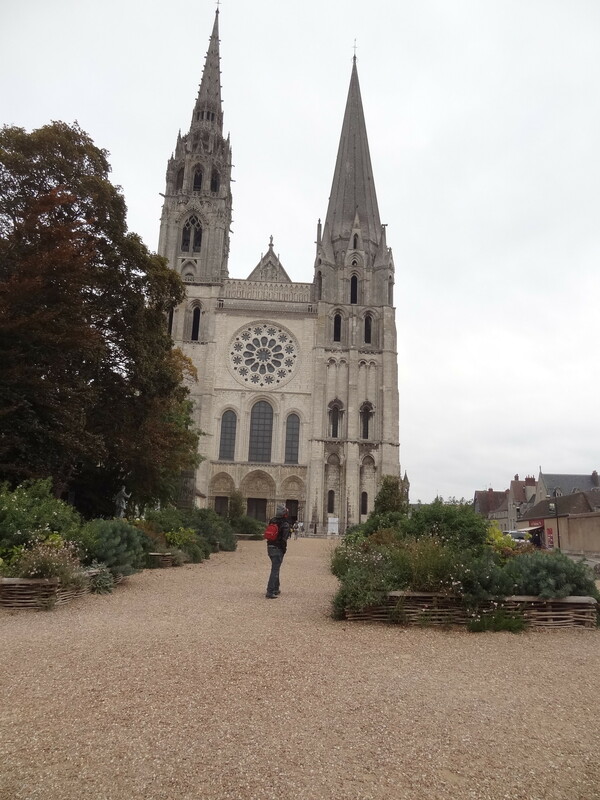 As we were leaving the town of Rouen, we headed for the coast and the region of Normandy. It was almost 5 PM when we drove into the Chateau, known for its potager’ garden. I assumed it would be way too expensive but we asked anyway and decided to stay. David and I instantly liked the owner. He groaned when I said he must work terribly hard to maintain this place. It’s Downton Abbey (but his name isn’t Robert). He told us part of the history of the castle as we walked up the three creaking flights of stairs to our room. this house has been in his wife’s family for three generations. Her grandparents bought it in 1938 when Europe and Hitler were looking iffy. They had 9 children and wanted to find a place that might be safe for them. Spent 18 months rejuvenating the house, and then it was requisitioned by the French army as a training base. Then the Germans seized it . At the end of the war, the Americans used it to finish their work . The house and their family survived all that until a young GI tried to make a fire with green wood in the kitchen and decided to pour a little gasoline on it. Only one half of house went up in flames. 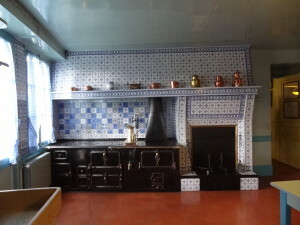 The potager garden (kitchen garden) is surrounded in red brick walls. This keeps out critters, wind, and makes a lovely back drop. They’ve won several awards in France and are conscious about planning for changing weather patterns that are already beginning. 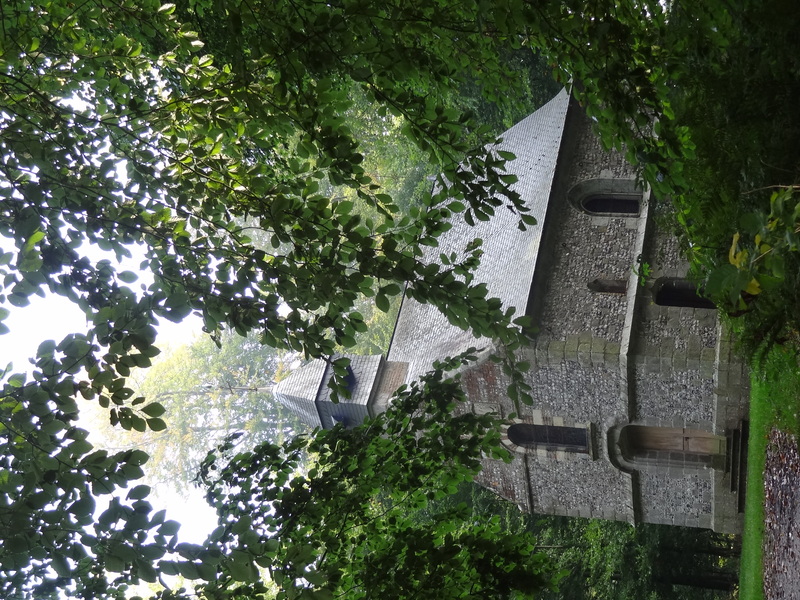 I walked out to the family chapel in the midst of the surrounding forest. It all smelled musty and mushroomy. 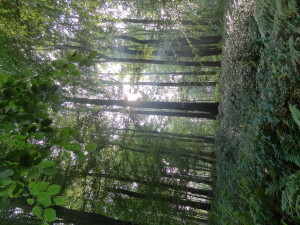 Sunlight filtered through the beech trees as they began to turn yellow. Dedicated to Saint Anthony the Hermit, the small stone chapel built in the 11th Century was once a pilgrimage site. People from the nearby villages would walk here to bathe their legs in the pond (which no longer exists) to cure their varicose veins and other problems. our room is round and the bath has a big claw foot tub. There are little doors in the halls that lead to little spaces—weird. At night the wooden shutters flap in the wind. I think they whisper “Heathcliff!” Oops! Wrong story wrong country. 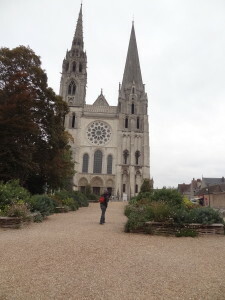 David and I have been cruising thru villages and getting lost on all the little back roads of Normandy. 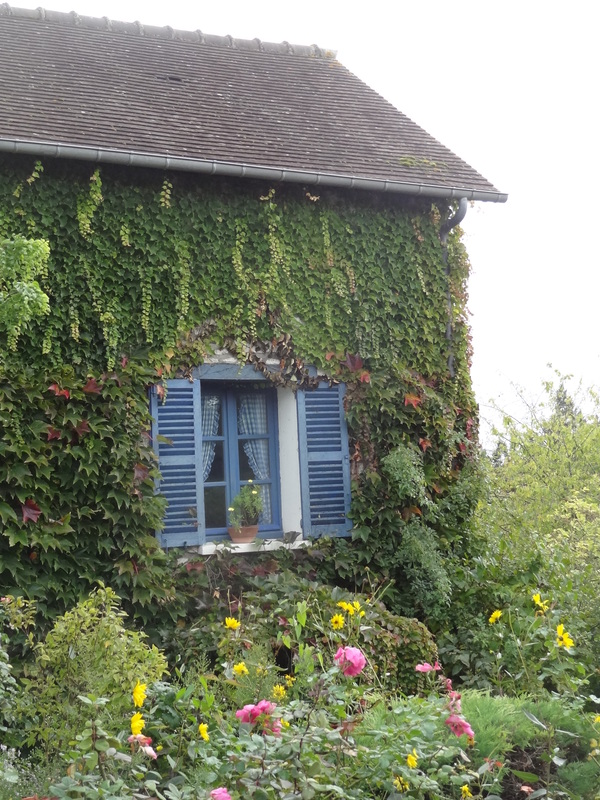 The countryside and the architecture of many village chateaus and farms is mesmerizing. The soil is a cafe latte color, huge John Deere tractors tilling it up all day long and rolling gentle hills of green. It has been an incredible blessing to meet the owners and stay in this beautiful old house. PS Can’t figure out how to turn the picture. Bleary eyed, the world is glossed over—I’m having a genuine Impressionist moment. Blues dissolve into yellows and greens reign. The truth is, tears blur my vision. I can’t believe I’m here. Giverny, a short drive north of Paris. Well, truth be told told, it took David and I four hours of frustration, and more anger than I care to admit to get here. The English speaking manager at the McDonald’s outside of Paris finally saved us. Giverny (pronounced gee vehr nee) is/was the home of Claude Monet in his later years. He designed, built, and planted this garden so that he could paint flowers and see them from every window. 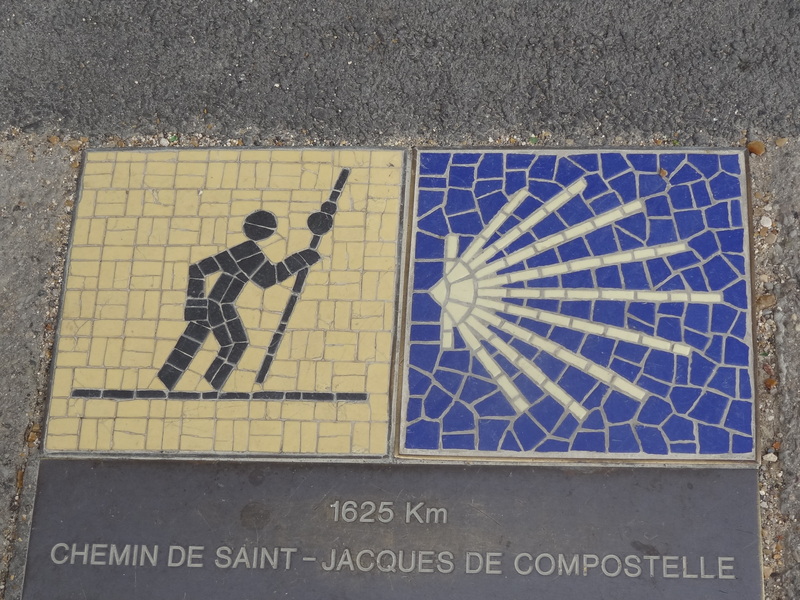 This is the ultimate pilgrimage—the Compostela of Gardeners. I want to cry because I can feel all my gardening buddies walking with me—Judy, Kristin, Jana, Pat, Renate, Annie. Carolyn, you are so here next to me I can almost hear your words. This man genius painter understood on a deep level how light continuously transforms the world around us—for his garden . His vague outlines and discontinuous brush strokes bleed altogether as if he were seeing through tears. I don’t know if Monet was a religious man or not, but he knew. He grokked. He sensed what the great yogis of India wrote about for thousands of years. The world is nothing more than condensed light and flowers whisper to us of something greater than our I, me, mines. In a broader sense, one could say he was self realized. Sell the second car! Rent the house! 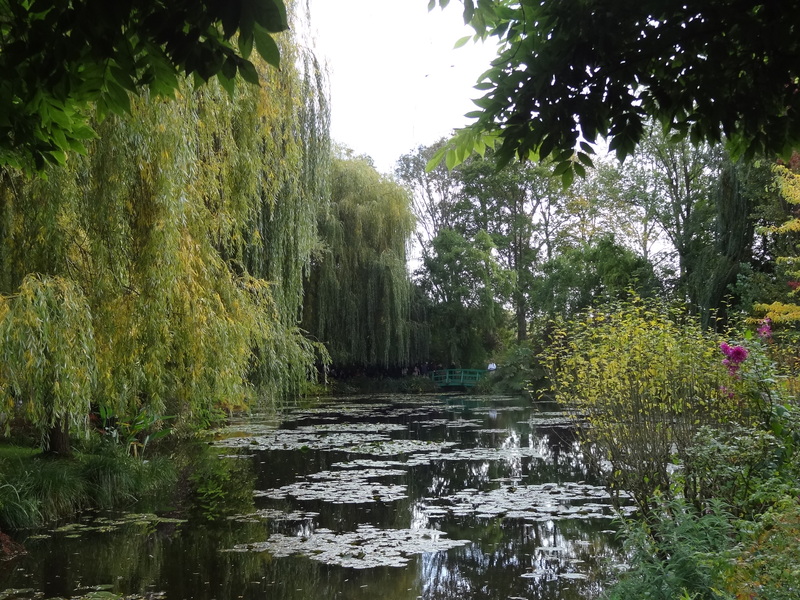 Save your miles, but come to Giverny before you die. Every window is a photo, every doorway a scented enigma. There’s a stunning white garden in front of the Monet Museum with Japanese anemone, cactus and dinner plate dahlias, alyssum, Nicotiana and lots of burgundy foliage/ivy in the fall. There are hedges in the museum garden that divide into rooms of colors—pink and lavendars, yellow and oranges. 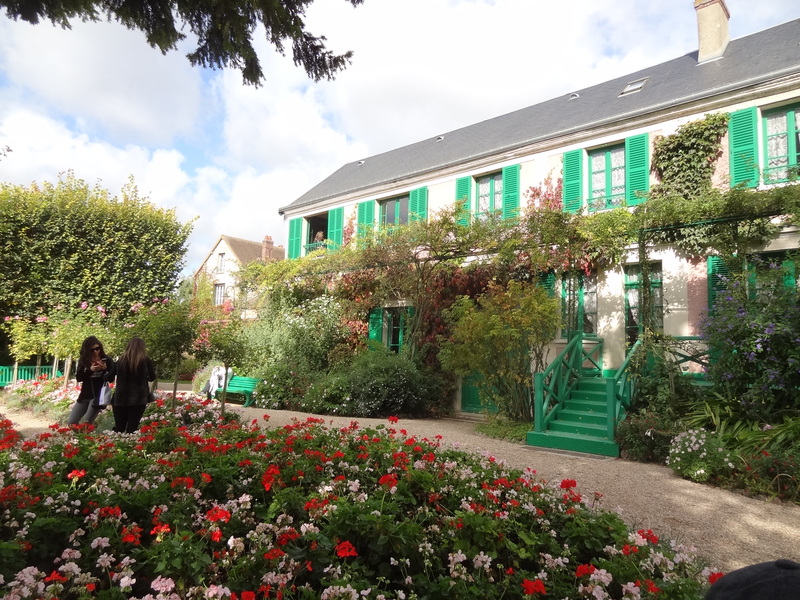 And I haven’t even been to Monet’s actual garden and home yet. I’ve only walked thru the village. The city has worked hard to maintain its integrity and not turn it into a Disneyland. At the metro. We started the day heading for Notre Dame. 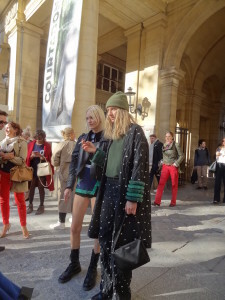 Parisiennes are like gophers. They tunnel thru the underground on the their way to work and play on the very efficient Metro—layers of more and more trains that take you just blocks from anywhere in the city. It’s fairly clean, and even at midnight feels safe. Any time of day Parisiennes are rushing up the stairs or down the escalator to catch their next ride. It was quite impressive, and encouraging that cities can create mass transit that works. Our first morning in Paris, we stopped at a spot called the Place de Vosges. A plaza filled with history and surrounded by what used to be a grand palace and now has been broken up into very exclusive apartments. Then a brisk (everyone walks quickly) walk to Notre Dame. We lingered outside for awhile in the garden – incredible, inspiring but the lines to go inside were so long that we decided to hop a bicycle taxi for a region called La Mufetarde and a good lunch. Winding streets near the Sorbonne filled with interesting shops and students eating fast food—crepes. My salad, like the women of France, was perfectly dressed—light but not heavy on vinaigrette with lots of varieties of textures, pine nuts and a goat cheese that was fried maybe coated with something like Panko. Chicken and vegetable ragout like dish in a light blue cheese sauce was OK. I love how they eat—slowly, lingering chatting and enjoying. . And of course, Mr. david engaged two handsome older men with his map quest. They actually spent 20 minutes trying to help him find what he was looking for. Another brisk walk (David was still walking briskly. 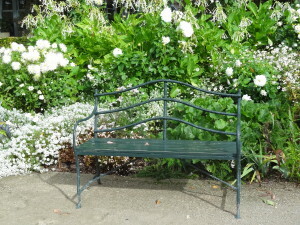 I was beginning to drag) took us along busy thoroughfares in to Luxembourg Gardens—60 acres of terraced woods and broad avenues for strolling. sunny flower borders were filled with red ruby chard interspersed with red dahlias, light orange geraniums, burgundy basils, red and orange and yellow zinnias. Another mound of lavendar and purple petunias blended beautifully with peachy pink geraniums . All surrounded by fluorescent green grass which you DO NOT walk on. The broad boulevards leading to the Luxembourg Palace are lined with benches where people sit under the canopy of horse chestnut trees. What I especially liked was the statues — not military men or great politicians but artists, poets, and demigods that almost seem like guardian spirits. It wasn’t the landscaping that was so delightful. IT WAS the people. relaxing in the ate afternoon warmth several pools with beautiful fountains are surrounded with hundreds of green metal chairs that people , sit or lounge or laugh together. More than many having a smoke! This was people watching at its finest. Business men and taxi drivers come here to unknot their ties. Young fathers snap photos of their twirling toddlers while the bells of a nearby church toll. Properly starched matrons sit with a friend and puff elegantly on their cigarettes. Beaming young mothers stroll with their prams or strollers. And everywhere young people, in secluded spots, intimately entwined with each other. French people enjoying the art of relaxation and connecting with each other—something I don’t experience much in our own culture. And their government spends money to maintain these lovely surroundings for people. Of course, sales tax everywhere is more than 10% but what a great investment .